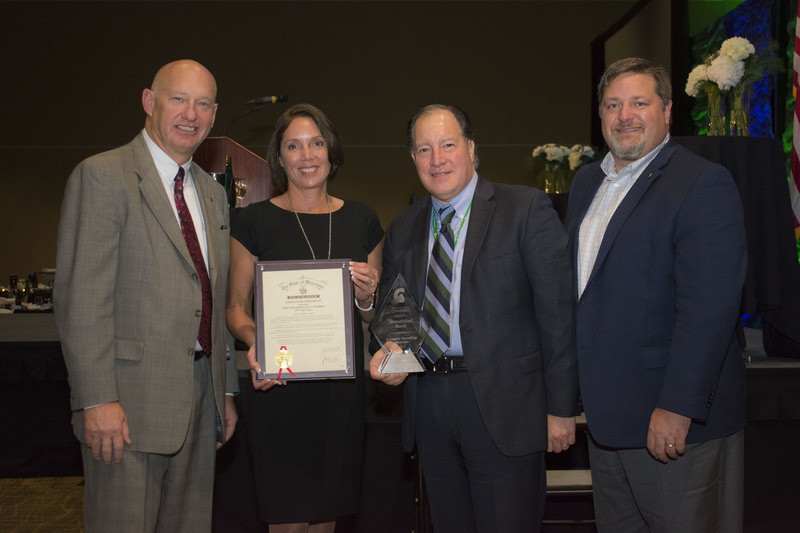 Pictured from left: Julian La Mue, Tracy Stansbury Lemsky, Chris Niles and Bryan Hyska from Associated Bank accept an award recognizing the bank as one of the six longest-standing chamber members. On Tuesday, Oct. 17, Associated Bank was recognized at the Greater Green Bay Chamber’s 135 Annual Dinner as one of the six longest-standing chamber members. Governor Scott Walker honored Associated Bank and the other longest-standing members for their commitment to the Chamber. The founding of Associated Bank dates to 1970, when three strong banks in Northeast Wisconsin – Kellogg Citizens Bank of Green Bay, Manitowoc Savings Bank, and First National Bank of Neenah – formed a powerful alliance. The Neenah-based bank is the oldest branch in the family tree dating back to 1861. Sonia Aranza, award-winning global diversity and inclusion strategist, was the keynote speaker and shared highlights on how diversity is a competitive advantage in the workplace. The chamber also presented a variety of other awards. Other longest-standing members include GLC Minerals LLC, Green Bay Press Gazette, Johnson Insurance, Sanimax USA LLC and Wisconsin Public Service.